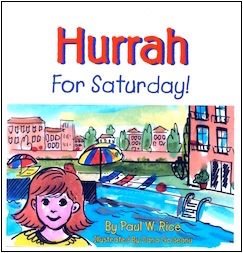 Hurrah for Saturday was inspired by a small neighbor that Paul Rice used to find sitting on my front doorstep on beautiful Saturday mornings. She knew that my daughter Abbie would come to see me on Saturdays and she wanted to play with her. They were about the same age and could always get into a lot of mischief, especially if I was persuaded to take them up to the apartment swimming pool. The description of her in the book fits her to a "t".